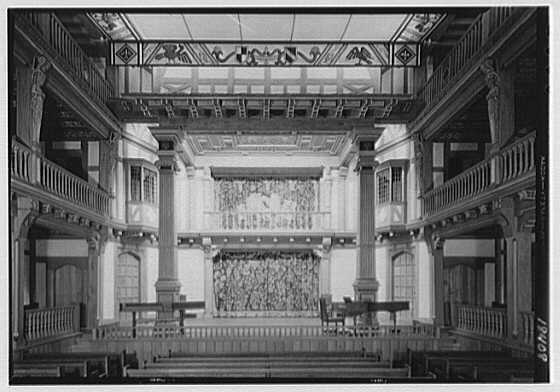 Besides the seating, not much has changed in the Folger Theatre since 1932, when this photograph was taken. Yesterday morning I arrived at the Folger Theatre just after 11. The line of people waiting to get free tickets to Taffety Punk Theatre Company’s “Bootleg Shakespeare” production of Love’s Labour’s Lost already stretched around the building into the Elizabethan garden, that is to say, the line was long, lengthily extended, occupied by a large number of persons standing, meaning on two legs without moving, motionless as it were, except for their lips. I know, my Holofernes imitation needs work, but so much for that. “The guy I’m talking about is only sixteen,” she said. She looked just a few years older than that. I put on my headphones and minded my own business. Then I thought maybe sixteen wasn’t too young. After all, some scholars (some of which probably are smarter than Holofernes) think that William of Stratford wrote Hamlet in 1589, when he was only twenty-five, if you can you believe that. These are rowdy affairs. Last year’s spectators watched Hamlet run around the stage buck naked. “Bootleg Shakespeare” always proves to be a unique experience. Last night’s Love’s Labour’s Lost was no exception. Directed by Lise Bruneau, the strong cast was led by Tonya Beckman (Princess of France), Dan Crane (Prince of Navarre), Esther Williamson (Rosaline), Shawn Fagan (Berowne), and Jamie Beaman (Boyet). In my opinion, Eric Hissom (Don Adriano de Armado) and Kimberly Gilbert (Moth) stole the show. With a thick yet completely intelligible Spanish accent, Hissom shifted easily between grandiosity and melancholy playing the magnificent, love struck Armado, to uproarious comic effect. Gilbert, as the page Moth distracted by reading the Kama Sutra, was his perfect foil. Max Reinhardsen as Costard was also excellent, as was Victoria Reinsel as Jaquenetta. Dressed like Daisy May in low-cut red polka dots and blue jean hot pants, she was sultry as sultry gets. The venerable Ted van Griethuysen entered an appearance as Marcarde. The Folger Theater looks like an Elizabethan Renaissance playhouse. Small and intimate, it’s the best venue in town for seeing Shakespeare, in my opinion. Watching “Bootleg Shakespeare” there, admiring the actors who’ve rehearsed only briefly with each other, I imagine this must be a little like what 16th century playgoers at The Globe experienced, where the players staged a different play every day. “Bootleg Shakespeare” is a must see — but you’ll have to wait until next year. Stay informed about next summer’s production by visiting Taffety Punk’s website and signing up for the newsletter. Next up for Taffety Punk: an all-female production of Titus Andronicus.